Sticky Roll™ is a safe and effective system that is easy to install. For use in areas such as: dairy barns, horse stables, animal premises of all kinds, veterinary areas, kennels, zoos, food processing areas, and anywhere flies are a problem. USDA testing shows that Sticky Roll™ captured 92% of available flies, an astonishing performance. Sticky Roll™ is completely non-toxic and non-polluting. 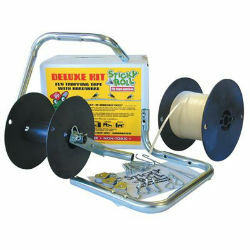 The Deluxe Kit comes with pulleys, hardware, and take-up reel, as well as a 1000’ roll of 1/4" wide white sticky tape.